‘Death Note Vol 1‘ is the first part of this manga. 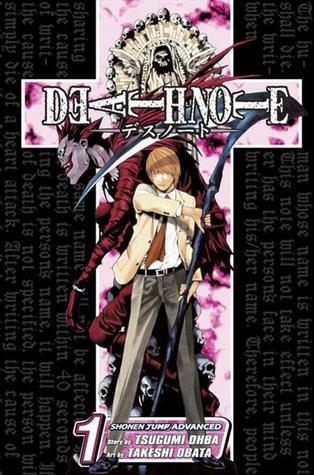 A manga is the Japanese equivalent of what we all know as comics or graphic novels and since ‘Death Note‘ is originally Japanese it’s referred to as a manga. Since this is not a regular book I wanted to explain this for readers who have never read or maybe even seen a manga. I signed up for the Goodreads 2015 Reading Challenge, but I’m also following the list with 50 challenges to make it more interesting for myself. And since one of the challenges is ‘a graphic novel’ this is the one I choose. I got this one as a gift from a family member who’s totally into mangas. He thought that I might like it. I have to say that I have read this one before, when I got it but I wasn’t able to recall the story or any of the details. I love art and I love stories, so you would probably say that comics and mangas would totally be my thing. It’s not though, I can’t really explain why. Well, now that I’m thinking about it part of it probably has to do with the fact that I rather have my own ideas about books, stories, characters and what everything looks like. And in the case of a comic or a manga you already know what everything looks like. Besides that considering how much I love details in stories they can’t really be told in a comic. You can only tell your story through images and short sentences. What honestly surprised methough was the fact that this story has a really good storyline, interesting and original. There is a depth in this story and the characters are really well developed. It’s a story of good versus evil, but when is good really good and evil really evil? In ‘Deathnote’ the lines are blurred, really blurred. That’s what makes it interesting. If you want to try your hand at a reading a graphic novel, comic or a manga I can really recommend this one. This story has made me very curious and I definitively want to read the other parts as well.